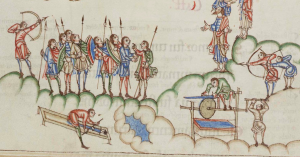 This is an illustration from an Anglo-Saxon copy of the Utrecht Psalter, an illustrated book of Psalms, probably originally from Francia and dating to the ninth century (the details are easier to see in the color copy than the line drawn original). The illustration depicts Psalm 64: on the right the psalmist stands under the Lord amid the forces of righteousness; on the left is the army of darkness. As Lynn White first pointed out, the interesting thing is that while the iniquitous are sharpening their swords the traditional way, using a whetstone, the righteous have invested in the very latest technology. In fact, this is the first known illustration of a rotary grindstone, being turned, what is more, by that most useful of inventions, the hand crank. This illustration is particularly useful to historians because it demonstrates that contrary to what you may sometimes hear, the medieval Church was perfectly capable of aligning virtue with technological progress. 2. Roger Bacon: “On the Hidden Workings of Nature and Art and the Emptiness of Magic.” This is an extract from a long letter that Bacon wrote to William of Paris, who seems to have asked him to discuss the possibility of doing marvelous things through magic. Bacon responded that magic was empty and evil, but that one could do truly wonderful things through technology. 3. Jacques de Vitry, “Description of University Students.” Jacques de Vitry (d. 1240) was a French bishop who traveled widely before settling down and attending to his very successful ecclesiastical career. Among his many works of history he included this not-very-flattering description of the students at the University of Paris. History of Applied Science & Technology by Hans Peter Broedel is licensed under a Creative Commons Attribution 4.0 International License, except where otherwise noted.